Oh, Hollywood… please stop doing this. If you follow Cinema Cocoa you already know how I feel about remakes, but I went to see this one in a hope that the character gets a bit more conviction than in previous installments (the original’s sequels, to be exact.) What I get however is still a watered down, play-it-safe and emotionally depleted money spinner. Let’s get technical, shall we? In the original film Alex dies, and is rebuilt as a machine with human reflexes. The corporation who built him, built him to a specific standard, as a product, as an implement to be used for their purposes. But the film’s theme is the power of human spirit to break free of corporate shackles; its a testament to human loyalty and inner strength. In the reboot, Alex doesn’t die, but is 99% replaced with robotic parts (I find this a little severe, bordering on laughable, considering he was burned and not shot to ribbons this time…) He is a man in a metal body first, he has all of his humanity. The conflict starts when OMNICORP realises having a human in combat isn’t as efficient as a robot, and they slowly modify him with stricter coding. Wouldn’t a corporation perhaps appreciate the human element before committing to a multi-million dollar project? This narrative makes OMNICORP not so much evil as just a bit… stupid. I won’t lie, having Alex’s family involved here is a good move; the original films needed to play this up and have those emotional bonds, and this film finally does that. But the execution is so drab and dull in terms of characterisation. I didn’t feel for any of the characters, not even Murphy himself, even before he becomes RoboCop his personality was wooden. His son doesn’t react at all when he sees his dad come home as a towering superhero! A lot of the film is talking. Dark Knight‘ing it up big time. Want to know the pseudo-science behind RoboCop, want to know the business plans and corporate backlash from RoboCop’s actions? I hope you do little under-twelve-year-old kiddy, or you’re gonna be boooooooooooooored. Seriously studios, you make this a 12A so you can get the family/kiddy cash, then pad your movie with millions of boardroom chat scenes and science jargon? What? Or is this your panicked way of making a longer film without any of Paul Verhoeven’s violence, satire or wit? Oh yeah, there’s no satire or wit. I was in a cinema full of mid-twenties to thirties men, I think there were two chuckles throughout the entire film. This isn’t just my opinion, the film has nothing of the original’s theatricality, brutality or satire. If you aren’t twelve, you’ll probably get bored fairly quickly. 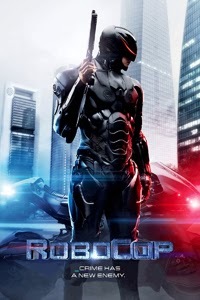 A lot of it is decent; the tech involved shows how RoboCop is so effective in combat; we see from his eyes enemies weaknesses etc, which does make it engaging. But unfortunately… for some reason… they made the final gun battle take place in the dark. Oh, great. So lots of strobe lighting and not being able to see what the hell is happening. SMELLS LIKE A 12A ACTION SEQUENCE! Ugh. I had some hope too. Gary Oldman and Michael Keaton are great but even their combined efforts cannot save their monotonous scripts. I don’t even mind the redesign of RoboCop or ED-209, the aesthetics are good, the CG isn’t bad either, and the family aspect is good. But gah, its such a… such a safe, boring and money-grubbing remake of something that exists already! You want a final good statement on this film? It is better than RoboCop 3.